Manager Financial Markets at Bank of Tanzania (BoT), Mr Lameck Kakulu (left) launching Stanbic Bank Tanzania eMarket Trader, a live web-based foreign exchange portal in Dar es Salaam. Looking on is Stanbic Bank Tanzania Head of Global Market, Mr Erick Mushi (right) and Head of Investment Banking, Mr Manzi Rwegasira (centre). 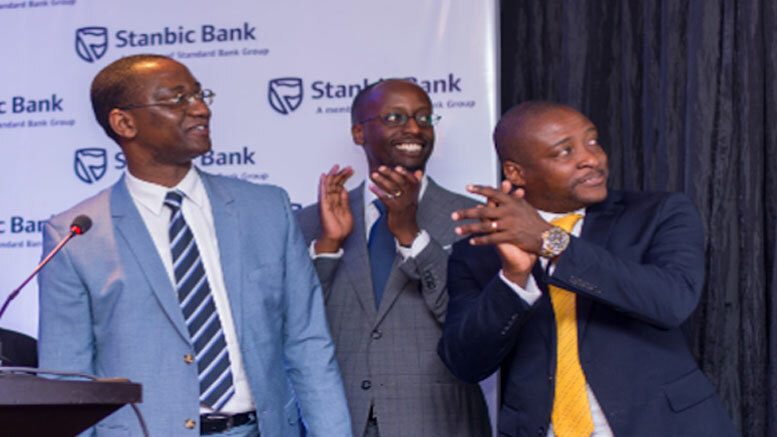 Stanbic Bank Tanzania launched a live foreign exchange trading portal dubbed e-Market Trader to provide clients with access to an integrated, web-based and real-time foreign exchange online platform. The portal includes live market insights, real-time pricing, and market research to be deployed to corporate, commercial and individual clients. The first of its kind in Tanzania, the e-Market trader digital platform allows customers to trade currencies at their convenience and offers real-time pricing for 64 currencies based on the market’s performance. Speaking during the launch event, the Manager Financial Markets at Bank of Tanzania (BoT), Mr Lameck Kakulu said “We are pleased to see Stanbic Bank, one of the key players in Tanzania’s financial sector, leveraging on technology through this innovation that features real-time dealing and access to Standard Bank’s research portal. “In the past, our clients had to call the bank’s dealing room to buy and sell currencies and were restricted to trade within working hours. However, with the launch of eMarket Trader, clients now have access to forex trading and real-time market insights” said Stanbic Bank Head of Global Markets, Erick Mushi. The platform also enables customers to place and monitor foreign exchange orders, access historical trade data on the market, and keep a record of all deals through trading receipts. The portal has additional unique features that are tailored to the market such as a customized user interface and executive live streamed spot transactions across dozens of currency pairs. This product aims to ensure the financial success of Stanbic customers whose businesses are linked across different global markets. Currently, USD 18 billion worth of transactions are performed on the platform and has over 5,000 daily users across the continent. The bank received accolades at the Banker Africa awards for being Tanzania’s ‘Best SME Bank,’ further demonstrating Stanbic’s commitment to making progress real for businesses thus driving inclusive economic growth in Tanzania.